Happy Christmas from Barnet Copthall!! Barnet Copthall SC wishes everyone a Happy Christmas! Read more about Happy Christmas from Barnet Copthall!! It seems I missed yet another club record at Bath - look, I can only blame senility so thanks to all the parents who keep an eye on the records for prompting me. Congratulations to Erin Nabney for improving on her own 100 breaststroke record at the Team Bath Meet at the beginning of December. Last weekend 150 swimmers from Dolphins to Seniors were at Barnet Copthall pools for the annual Club Championships. 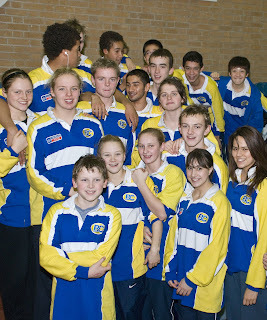 On Saturday evening they swam 50 free and 400 free, on Sunday afternoon 100 breaststroke and 200 IM and on Sunday evening 100 fly, 100 back and 100 free. Points are awarded to those in 1st place (8 points) to 8th place (1 point) in each age group and the Club Champions (announced in a previous news item) are those with the most points over all events - so truly all-round swimmers. Many congratulations to our new Club Champions for 2007. They will be presented with their trophies at the Barnet Copthall Presentation Evening in February.